Speakers include recognized futures expert Pete Mulmat and industry innovator, Tom Sosnoff. This complimentary two-hour event will cover challenging topics such as pairs trading, ETF synthetics, futures options and an introduction to trading digital currencies. Register today to see tastytrade hosts, Tom Sosnoff, Nick Batttista, and Mike Butler, speak at the The MoneyShow Las Vegas. Join Tom, Tony, Vonetta, Liz, and Jenny live in LA. In this rare opportunity, see how the sausage gets made as we film our morning show in front of a live studio audience! There will be games and special guests! 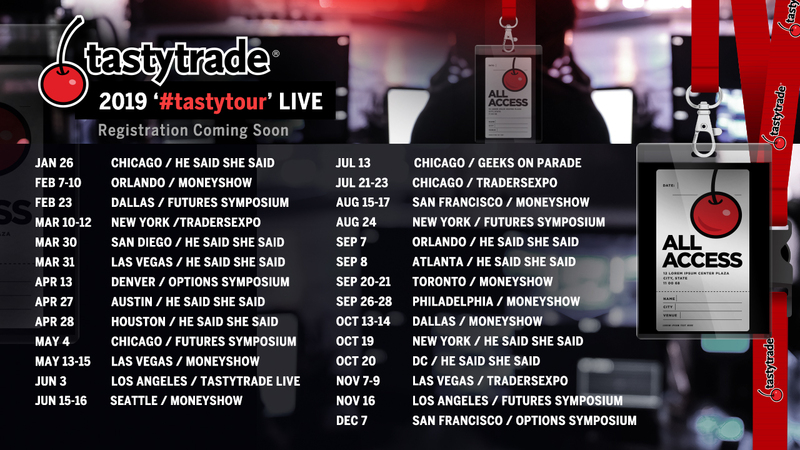 Join us for this very special episode of tastytrade live! Register today to see tastytrade hosts, Tom Sosnoff, Katie McGarrigle, and Mike Butler speak at the The MoneyShow Seattle.